Black Friday hi-fi deal: Save on five-star NAD stereo amplifier for Black Friday | What Hi-Fi? 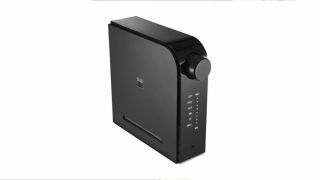 It may look like a wi-fi router, but this NAD D 3020 V2 is actually a compact, DAC-toting stereo amplifier. And a very good one at that. We're pleased, then, that readers can save £50 on it for Black Friday. Sevenoaks' £50-off deal brings the price from £399 down to just £349. This NAD tries – and succeeds – to be as versatile as ever. NAD has kitted the amp out with a moving magnet phono stage, with those turntable inputs sharing the rear of the unit with connections for optical, coaxial and RCA. Bluetooth also provides a wireless means to connect your source. Sound-wise, the presentation is tonally even, with great body to the sound, and its combination of timing and dynamics makes it a true entertainer. The original version won a What Hi-Fi? Award, and this V2 lives up to its predecessor’s hype. Those looking for a Black Friday stereo amplifier may not be spoilt for choice, but arguably there's no need to be when deals like this come around.